The Marchex Pay-For-Call Exchange combines a robust telephony platform with campaign creation expertise and call filtering technologies to create, manage and optimize advertiser campaigns across more than 50 publisher partners in online, offline and mobile media. Additionally, advertisers have access to rich call analytics and customer intelligence, including caller geography and call recordings. Advertisers that have joined Marchex’s Pay-For-Call Exchange have experienced significant ROI, including an average call conversion ranging from 20 percent to 30 percent for many advertisers, with some seeing as high as 50 percent; typical consumer engagement on the phone averages more than eight minutes, with certain categories and advertisers experiencing up to 12 minutes; and typical advertiser budget increases have averaged 200 percent of their initial commitment. Additionally, companies that have joined Marchex’s Pay-For-Call Exchange have been able to monetize their inventory more effectively. While still in its relative infancy, Marchex has built a significant, growing customer and partner base for its Pay-For-Call Exchange, including leading digital agencies such as Razorfish, one of the largest interactive marketing and technology companies in the world; ADT, the world’s largest electronic security company; PRIMEDIA, a provider of online, print and mobile platforms that provide real estate rental listings; and Jingle Networks, the nation’s leading advertiser-supported directory assistance service at 1-800-FREE-411. [A]n average call conversion ranging from 20 percent to 30 percent for many advertisers, with some seeing as high as 50 percent; typical consumer engagement on the phone averages more than eight minutes, with certain categories and advertisers experiencing up to 12 minutes . . .
Jingle Networks, cited in the release, had made an effort to create a version of this at one point. But to my knowledge this is a unique marketplace. I asked Christothoulou about the types of advertisers utilizing the service. He said that currently it’s mostly national advertisers and large advertisers targeting specific markets. PPCall has never lived up to the early hype (that I helped create) but a combination of factors, including more aggressive use of PPCall in traditional media and the rise of mobile, may mean that it finally gets the traction among advertisers that its value proposition has always promised. Google’s Click to Call into PPCall? Will national advertisers flock to the Google click-to-call model in droves and effectively out price many local advertisers? Will Google use the click pricing temporarily while it builds critical mass? At the recent CTIA show in Las Vegas I fortuitously ran into Google’s Chris La Sala (now in mobile) and a colleague while waiting for a cab. I opportunistically asked about click to call and pricing. I’ve always said “It’s a call for the price of a click.” What I didn’t realize is that Google will allow marketers to totally opt-out of online targeting. The above image is a screenshot from the AdWords dashboard. Advertisers can “uncheck” the “desktop and laptop computers” box and, viola, mobile-only targeting. As more advertisers realize this and embrace “Click to Call” it may become “Pay per Call” with prices rising accordingly. This is what Google would like to see as well. We also rolled out new formats and targeting options specific for mobile. This quarter we launched a Click to Call feature that automatically puts the phone number in the ad that is running on a Smart Phone. So if you are looking for auto insurance and do that query from your Android or iPhone the ads will include a number to call. 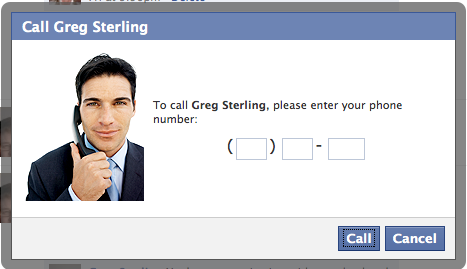 Not surprisingly this has increased click through, or should I say call through. Last year comScore and TMPDM reported that 46% of users who conducted a successful local business search online went on to contact that business via telephone. Google has decided to let all advertisers utilize its Click to Call program (only mobile, on high-end smartphones). Before you needed a physical address (i.e., local business). You associated a phone number with an address as part of Google’s location extensions in AdWords. Now you no longer need a physical address and can use any phone number in your ad. So the call can go to a local distributor, store or national call center, however the advertiser would like to route or handle the call. Google is still only charging for the click. In other words there’s no additional cost or separate bidding for the inclusion of the phone number. Google has done this to avoid complicating its system. But the company hopes that savvy advertisers will “get” the value of this and start bidding up the price of keywords and ads that contain phone numbers. National advertisers apparently were seeking access to the program, so Google decided to expand it. These ads perform quite a bit better than conventional AdWords on smartphones, according to Google. This is the PPCall program that everyone has waited for Google to implement, except that it’s a deal right now because you only pay the cost of a click. Early adopters will reap the benefits and the relatively low cost of these calls. I’ve also written about it at SEL. Today Google is formally launching functionality that enables a “clickable local phone number” to appear in mobile ads. In other words a phone number appears as part of the ad copy and consumer-users can simply tap the number to initiate a call (see image below). It’s a call for the price of a click on mobile handsets. Not available on PC AdWords campaigns, it’s only available on “high-end” mobile handsets with full HTML browsers. We wrote about this initially when an email went out to AdWords advertisers notifying them that Google was introducing click to call in mobile ads. Earlier today I was able to speak at some length with Paul Feng, Google’s Group Product Manager for Mobile Ads. He explained that the functionality is easily activated; it’s really part of AdWords local extensions. The Return of Click to Call? Click to Call as been around online forever, yet it has been little used. Historically yellow pages publishers (e.g., Superpages) that offered it saw limited use vs. more conventional phone calling to local businesses. At one time Google offered it as a feature to contact local businesses on Google Maps. But that was discontinued in 2007. Similarly the pre-Bing Windows Live Local also had “call for free” (C2C), which was later discontinued. Why? Basically because these services were not used except by a small number of people. We may, however, be entering a new period where Click2Call “returns” and becomes more widely adopted and actively used, as part of a larger movement toward VoIP services. Two developments point toward but don’t guarantee this . . . Adds a button to the toolbar, which displays the number of unread messages in your Google Voice inbox. Gives you quick access to your most recent messages with transcripts. Lets you initiate calls and send free text messages by just typing any number or contact name. 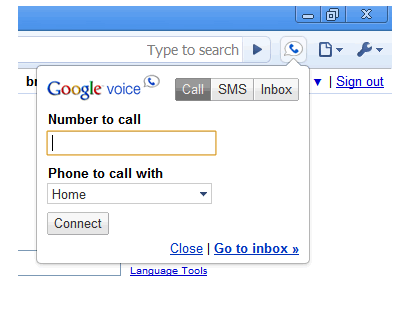 Makes phone numbers on websites callable via Google Voice by just clicking on them. Of course Skype has similar functionality, and is/was being used by European Directories as part of a local/Maps SEO strategy. As a momentary digression, imagine how Facebook might implement its own version of this: free calls domestically and low-cost, Skype-like calls outside the US. And imagine how this might facilitate “leads” to local businesses via Facebook. 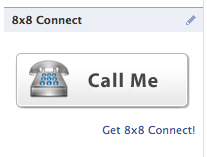 Although it might be hard to charge on a per-call/per-lead basis given the availability of the 8×8 Connect free service (or others that might crop up). Still this C2C capability potentially makes Facebook even more useful to local businesses as a marketing platform. The line between C2C and PPCall is a thin one, of course. We’ll see if these new services and/or others like them “take” this time around. My guess is that the market is now better conditioned to understand, accept and use these types of services. Agencies buy ads and bill per call: With so many different media options available, advertisers are challenging agency media plans and demanding more pay for performance ad models. In 2010, agencies will buy ads via subscription and bill back to customers on a pay per call basis. Online media continue to adopt pay per call: Recognizing that calls are a cross media metric and a metric that small advertisers quickly understand, digital players will continue to add pay per call to complement existing pay per click campaigns. Quality of calls closely evaluated: As pay per call moves from infancy to mainstream, advertisers will want a more clear definition of call quality. Publishers and agencies will have to carefully consider what defines a billable call, evaluating call duration by media type and category and looking at repeat callers over variable time intervals. Also, there will be a continued emphasis on call recordings for assessing leads. No shift to pay per conversion: Pay per conversion – in which advertisers only pay for advertising if a sale is completed – will not take off this year. While calls make it easier to track conversions, the model presents too much risk for publishers and agencies as it relies on advertisers to convert calls to sales after the lead has been delivered. There are a number of interesting conversion-based experiments going on the local space: booking, RedBeacon, HelpHive’s model and a few others. But conversion-based billing shifts the risk to the publisher from the advertiser and so there’s resistance to going that way. True PPCall is a hybrid approach: calls sell for more but they don’t always turn into sales; many are purely informational. Recoginizing that, Yext has moved to focus on call quality and thus beyond strict PPCall. I haven’t heard anything from Google to clarify what this was about. In addition, the conventional AdWords ads have returned above the LLAds. My suspicion is that Google wanted to see the effect on user behavior of removing the phone numbers and the traditional AdWords. We’ll see . . . What are others seeing? That was until last Friday when Conklin stumbled upon HelpHive, a Seattle online directory of local service providers. Conklin couldn’t believe what he saw. His business listing on HelpHive included a phone number, but it wasn’t the one he’d used for the past 30 years. It was a new number generated and controlled by HelpHive, a proxy number of sorts that the Internet upstart had set up to track calls it was passing on to the plumber. Can companies swap in things like call tracking numbers (very widespread) or other similar lead capture devices without the consent of the business itself? We’ll see if Conklin goes so far as to file a suit against HelpHive. If he were to, does anyone know of cases in this area that may have resolved the question of whether call-tracking or similar devices can be used without an SMB’s prior consent?